Studioware contains comprehensive accounts receivable functionality. Every student/family receives an account that records financial transactions. Studioware also contains many financial reports, such as the Income Statement Report, Class Revenue Report, Accounts Receivable Analysis, and Outstanding Invoices. Studioware automatically posts transactions to student/family accounts when certain events happen, such as an online enrollment into a class. Studioware also allows you to add, edit, and delete financial transactions. If you want Studioware to calculate taxes, you can define goods (sales tax), service (service tax), or goods and service tax (VAT or Harmony Tax). Studioware will calculate all taxes and post them to the student account. How do I add a financial transaction to a student's account? Can Studioware calculate my sales tax, service tax, VAT, or HST? 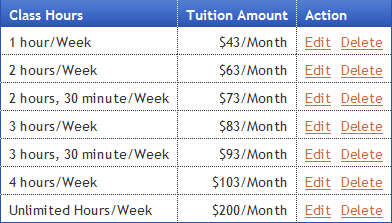 What is a "Tuition Fee Schedule" and how do I set the tuition amounts? How do I indicate that a class should use the Tuition Fee Schedule? How do I post the tuition and discount transactions to the student accounts? Studioware allows you to create professional looking invoices that can be printed/mailed or emailed to your students, families, and payees. You can configure your invoices to include your company logo, address, phone numbers, payment "stub", notes, and payment terms. Open a student record (via searching or browsing students), and click on "Create Invoice". This method is ideal for creating invoices for individual students. If you need to create an invoice for every student in your Studio that has a balance, you can use the Batch Invoice feature of Studioware to create multiple invoices. The Batch Invoice feature will create all invoices and optionally email the invoices to the students/family/payees all with the click of one button. Studioware tracks the status of all your invoices so you will never miss a payment. The "Outstanding Invoice Report" contains all the invoices with an outstanding balance along with the payee name and phone number. How do I create an invoice for a student? How do I create invoices for all my students? How do I configure the appearance of the invoices? A student, family, or payee makes a payment in person at your studio. You simply record the payment in Studioware and apply it to an outstanding invoice. A student, family, or payee mails in the "stub" from a printed invoice along with a check. Again, you record the payment in Studioware. You can configure Studioware to allow for your invoices to be paid online. If a student, family, or payee makes a payment online, Studioware will automatically be updated with the payment information. If an online invoice is paid in full, the invoice status will be switched to "Paid In Full". This is the easiest and most time saving method of accepting payments, because any payments made to an online invoice is automatically updated in Studioware. How much do online invoice payments cost? Online invoice payments is included in the Premium Edition of Studioware. That is, for only $24/Month you can subscribe to the Studioware Premium Edition and allow your customers the convenience of paying their tuition charges online. Creating a PayPal account is easy and free! Visit www.PayPal.com to learn more. How do I allow students, families, or payees to make online payments on invoices? How do I manually enter in an invoice payment? I opened a small Fitness Studio four months ago and was in desperate need of a program that could help me organize my clients, classes, instructors, class income and accessories sold at the Studio. As a brand new businesswoman, I had no idea how to keep track of everything but Studioware proved to be instrumental in helping me build a solid organized system as the foundation for my company. Studioware is the perfect program for my company and makes my life and my business run very smoothly. This program allowed me to organize everything is such an extensive fashion that it saves me a lot of time and confusion. If you’re looking for a program to help run your gym or studio, I highly recommend this program. Do yourself a favour, get Studioware!